The season's greetings to all our customers. We hope everyone had a great Christmas and are looking forward to a very Happy New Year. We are open today Sunday 28th of December and Wednesday the 31st, New Years Eve. We will reopen again on Friday, 2 January when we will return to a normal opening times. It's a lovely day today outside even if it is a little chilly, a great day for a walk round the words and then back to the farm shop for a hot drink with a cake or mince pie or if you're still hungry after the Christmas feast, a bacon roll or a breakfast bap. 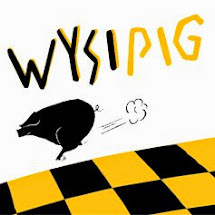 Christmas at ‘Wysipig’, lots of great things on offer at todays ‘open day’, Saturday 13th December from 10am to 4pm. Customers are welcome to join us and get into the Christmas spirit. Visitors will be able to try samples and discuss Christmas orders for turkeys, gammons, sausages and beef from the great range of meat and other products now available. The farm shop is packed with Christmas goodies and customers can place their orders to be collected or take advantage of the free delivery service. For Christmas the farm has a great gift shop in the barn, come along and have a browse, there is a wide range of suitable presents for all the family as well as lots of other interesting bits and pieces. As usual there will be ‘Wysipig Breakfast Baps’, Christmas special-Turkey with Sage & Onion and Cranberry Sauce rolls for lunch as well as teas, cakes and of course mince pies and cream! The team will be on hand to help with advice on ordering and cooking tips, they look forward to meeting you. The shop is open daily until Christmas and orders can also be made by telephone. For more details or to place an order call (07774) 989362 .